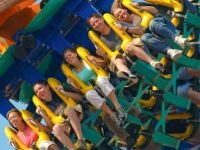 Complete list of amusement parks in PA. Find the best of the best when it comes to theme parks in Pennsylvania! Splash, Slide and Surf Your Way To Fun-RIGHT OUTSIDE PHILADELPHIA! Sahara Sam’s Oasis Indoor & Outdoor Water Park is New Jersey’s only free-standing indoor water park with 58,000 square feet of indoor aquatic attractions under a one-of-a-kind retractable roof. Sahara Sam’s attractions include Mount Kilimanjaro family raft ride, Snake Eyes tube slides, Congo Bongo Adventure River, Tim-Buk-Tu water tree fort, Lizard Lagoon for toddlers, Sam’s Slamdunker, Crocodile Flats cargo obstacle course and FLOWRIDER—the area’s ONLY indoor surfing simulator! Our seasonal 2-acre outdoor recreation complex has a 10,000 square foot wave pool for guests to jump waves or float in on the tide with tubes. Guests can “take a dip” in the 25-yard leisure and activity pool. To complete the outdoor area, there are special attractions for Sahara Sam’s younger and older guests. A kiddy splash area and water play zone are the perfect spot for little ones to beat the heat and play the day away. Adults love the Tiki Hut bar, recreational cabanas, and sand volley ball courts that complete the feel of a true Oasis getaway. Sahara Sam’s also features SAMAZON Ropes Adventure, The World’s Tallest Ropes Course (seasonal), a full-service café and a 3,000 square foot family arcade. Sahara Sam’s is the perfect place for your next family outing, birthday party, group trip and special event. For more information, ticket prices and hours of operation for Sahara Sam’s Oasis Indoor Water Park, visit SaharaSams.com. Voted Best of South Jersey: Children’s Play Center and Place for Children’s Birthday Party! Sahara Sam’s is conveniently located only 30 minutes from all Philadelphia bridges. FREE PARKING! Family entertainment center features Go-Karts, Miniature Golf, Batting Range, Golf Driving Range, Bumper Boats, and Outdoor Laser Tag. Group packages available for both professional and recreational group needs. Outdoor Laser Tag is especially attractive for team building fun. Plan a laser tag outing on our three acre field or let us come to you with our mobile laser tag set up. Either way, fun and memories are created. Don’t miss our newly updated arcade and the birthday party opportunities it provides. Best family amusement park in Pennsylvania! 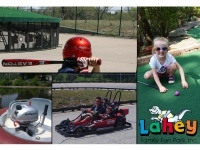 Lahey Family Fun Park is your destination for family fun in Northeast PA! 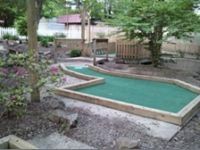 Lahey features two amazing miniature golf courses built into the side of a mountain covering over 2 1/2 acres. Five large waterfalls flow into seven streams which wind through the courses. 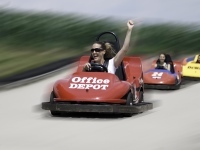 The quarter mile, fast-paced Go-Kart track is great for the thrill seekers in the family. Double seater karts are available to drive the little ones around. Nine outdoor batting cages offer pitches for all ages and skill levels. Slow or fast pitch softball, and hardball from 40-70 mph. The Bumper Boats are a great way to have some fun and cool down on a hot summer day. Inside, an Arcade, Soft Play area, and snack bar will bring out the inner child in everyone. Bring your family to Lahey for a full day of Summer fun! PA's Largest Free-Admission Amusement Park! 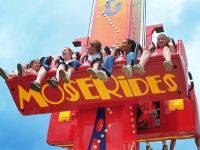 Get ready for some of the best amusement park rides anywhere! From the Grand Carousel with organ music and brass rings to the world-class thrilling roller coasters! The kids will love the huge array of kiddie rides, which includes a mini Merry-Go-Round, Kiddie Wheel, and even kid-sized Bumper Cars! For the older family members, there are plenty of thrill rides to keep you screaming! Roller coasters, the Flume, spinny rides, upside down rides - Knoebels has it all! The family rides are perfect for every member of the family to enjoy. Parents can experience thrilling fun with their children on these rides. Aside from rides, there are many attractions for visitors to take part in. This includes a Shooting Gallery, a Bald Eagle Habitat, Lazer Runner, Miniature Golf, a History Museum, and much more! When you start to get hungry, stop for pizza, burgers, funnel cakes, or ice cream. Knoebels is best known for their variety and quality of food. Knoebels also has a water park with waterslides and diving boards. For the little ones, there is a shallow pool area with fountains and much more! The fun doesn't have to end at the end of the day because Knoebels has two campgrounds, complete with cabins, camper parking, and tent areas. Bring the family vacation to Knoebels for a season full of great camping! Best Amusement Park for Kids in PA! Idlewild Amusement Park was voted the Best Kids' Park in the World by Amusement Today. 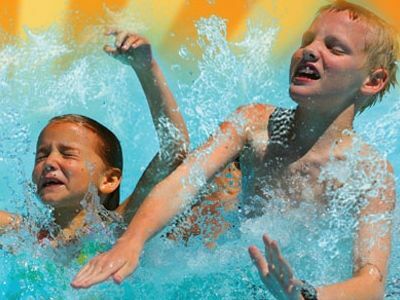 If you're looking for summer fun, Idlewild and Soakzone are the perfect places to go. You can cool off at the Wowabunga Family Wave Pool, which is 280,600 gallons of fun. There's also a "beach" area surrounding the Wowabunga, which contains chaise lounges and Cabanas that guests could rent to escape the hot summer sun. Take advantage of many kid-friendly rides and attractions, including Olde Idlewild, Story Book Forest, Raccoon Lagoon, and Mister Rogers' Neighborhood of Make Believe. With Idlewild and Soakzone, you get two parks in one! It's guaranteed fun for the whole family! Two Great Free Admission Amusement Parks in PA! 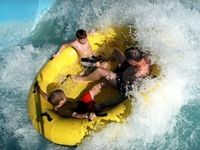 At both Waldameer Park and Water World, you can take advantage of over 75 rides, slides, and attractions. Best of all, admission is free! When your stomach starts to grumble, take your pick of Waldameer's wonderful selection of mouth-watering foods like French waffles, candy apples, funnel cakes, cookies, take home fudge, and more! You can also enjoy a ton of cool live song and dance shows that occur throughout the day. Water World is wet and wild fun for the entire family, with its unique variety of slides and attractions for all ages! Inside are 16 slides of various thrill levels, kiddie pool areas, a refreshing endless river, and a soothing heated relaxing pool. Best Amusement Park in Eastern Pennsylvania! Dorney Park in Allentown, PA features thrilling rides, fabulous food, award winning entertainment, and much more! There are roller coasters, thrill rides, family rides, and even water rides for everyone in the family to enjoy. If you are feeling daring, ride one of the thrill-seeking roller coasters that will make your head spin, heart throb, and hair stand straight up. If that's not enough, try one of the park's eight thrill rides that will lift you off your seat! 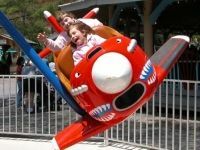 Dorney Park also has over ten family rides which will meet both you and your child's fun-filling needs. On hot days, Dorney Park's signature water rides will come in handy. Fun, thrill, and water are combined to make great rides for everyone to enjoy! There are more than 40 food locations throughout the amusement park, which includes restaurants, fun foods, meals for kids, and great refreshments! A variety of live shows take place every day at Dorney Park. The 13-piece band, singers and performers will make you move to the music. The park has many different shops to wander into for collectibles, clothing, novelties, plush toys, and souvenirs. Along with all of this, there are four major strips of games with multiple challenges gathered in one area and individual skill sites scattered throughout the park. There really is something for everyone at Dorney Park! Fun Amusement Park for Kids in Langhorne, PA! Play all day at Sesame Place in Langhorne, PA! The theme park features a mixture of an amusement park and a water park. Just go to ride the Dry Fun Attractions or on a hot day try some of the Wet Fun Attractions. The kids can play around in Big Bird's Court, a colorful and engaging play area, try to clear a path in the Monster Maze, slide down Snuffy's Slides, or climb up the Nets 'n' Climbs. Elmo's Cloud Chaser will send you up into the air, the Sunny Day Carousel is a cute and colorful go-round, or go for a ride with the whole family on the action-packed steel roller coaster, Vapor Trail! The Wet Fun Attractions include fun slides, pool with fountains and wet surprises, and a multi-level interactive water-play attraction called The Count's Splash Castle. Along with all of the fun rides are shows, parades, and games! The kids will love "Elmo Rocks! ", a hilarious musical show starring Elmo with Zoe, Cookie Monster, Bert, and Ernie. Abby Cadabby's Treasure Hunt, starring Abby Cadabby, is a musical show featuring Elmo, Cookie, Rosita, Grover, and Oscar. Join Elmo, Mr. Noodle, and Dorothy as they explore the concept of dance in Elmo's World Live Show. Don't miss the Neighborhood Street Party Parade, which is new for 2011. Your children can dance along with their favorite characters at these fun shows and parades! The Most Delicious Amusement Park in PA! Hersheypark in Hershey, Pennsylvania is a delicious amusement park! Start off your visit at Hersheypark at Hershey's Chocolate World attraction. Go on the free Hershey's Great American Chocolate Tour Ride, and receive a free Hershey's product sample. Visitors are able to create their own candy bar using real factory equipment. 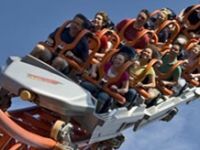 Hersheypark has many thrilling roller coasters for the daring family members, family rides for the whole family to try, kiddie rides for the children, and even water rides. The Boardwalk offers nine fun-filled water attractions. Entertainment is available all day throughout the park, but song and dance shows such as Strolling Shows and the Summer Concert Series take place on special dates at Hersheypark. A new fun-filled dining experience provides a delightfully themed atmosphere with carousels, coasters, and characters. Dutch Wonderland features 30 fun-filled rides, including 2 kid-friendly coasters, water rides, and a merry-go-round! Some rides are just for kids, while others are rides that would be fun for the entire family. 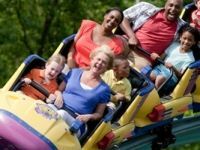 Dutch Wonderland is perfect for families with children. There is live entertainment everyday, as well as games and a great water play area with no deep water. There are also many treats to enjoy. Dutch Wonderland is open weekends spring through fall and daily Memorial Day through Labor Day. 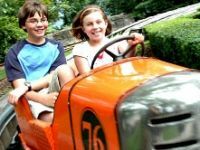 Located in the Allegheny Mountains of Central Pennsylvania, DelGrosso's Amusement Park has been providing fun, food, and memories for over six decades. It is a safe, fun, affordable, and delicious facility which includes more than 30 rides, a water park, go-karts, a miniature golf course, and America's Best Amusement Park food. Check out DelGrosso's website for when the fun events are happening! A Great Park over 100 years old! Kennywood Amusement Park was founded in 1898 and has been delighting its visitors for over 110 years! The park has been successful in putting a smile on everyone's face. Kennywood was designated a National Historic Landmark in 1987 for good reason. Whether you want to ride the carousel on go on one of their exhilarating roller coaster rides, you will find a way to have a fun-filled time. "Lost Kennywood" contains turn-of-the-century architecture and houses some of the best amusement park rides you'll ever find! Kennywood also has more than a dozen great dining areas that can't be found at any other amusement park. A Spectacular Central PA Amusement Park! As well as being home to the oldest rollercoaster (Leap-the-Dips), Lakemont Park in Altoona, PA is the 8th oldest amusement park in the United States! Have a blast with over 30 rides and attractions for the entire family, including two rollercoasters, a go-kart track, an 18-hole miniature golf course, an arcade, and a delightful assortment of games! Feast on delicious, all-American amusement park food at eight different eateries! Check the website for fun-filled upcoming events, including Family Movie Nights and holiday celebrations. Lakemont is also home to the Island Water Park, where you and your kids can enjoy a Pirate Ship Activity Pool, in-ground pools, and kid-friendly water playgrounds. Enjoy Rides and More at this Great PA Amusement Park! Experience amusement, thrills, and much more at Conneaut Lake Park! Yell and scream on the awesome rollercoaster Blue Streak! Hit some balls at the miniature golf course. Take the little ones to such kid-friendly rides as the Kiddieland Carousel, Kiddieland Boats, and the Kiddieland Go Gator (the new mini-rollercoaster). 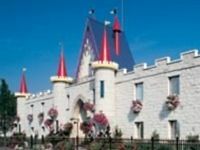 In addition to being a topnotch family amusement park, Conneaut Lake Park offers a lovely beach, camping, hotel lodging, dining experiences, entertainment, and community events. It's also known as one of the most affordable vacation spots in PA!